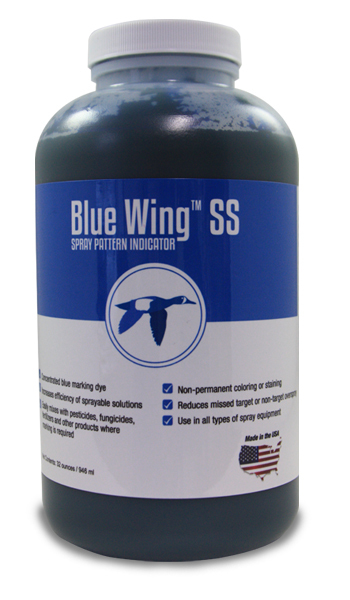 Blue Wing™ SS is a highly concentrated spray pattern indicator dye used for clearly marking the application of pesticides, herbicides, fertilizers and other sprayable solutions where application efficiency is required. Blue Wing™ SS leaves a vibrant, visible and non-permanent blue color to natural or manmade surfaces. Shake well before use. Product usage may vary upon required color per application. For best results, first use Blue Wing™ SS at manufacturers recommended application rates. Apply Blue Wing™ SS to actively filling vessel prior to the addition of active ingredients used in applications. Agitation will fully disperse Blue Wing™ WSP throughout the entire sprayable solution. Apply straight from container. Add 6 – 8 ounces of Blue Wing™ SS to every 100 gallons of total sprayable solution. If darker color is required, add 2 more ounces at a time, allow for full agitation of solution. Check coloring and add more if desired.